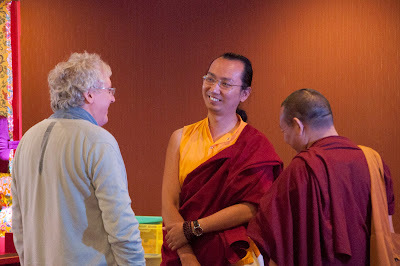 His Eminence Ratna Vajra Rinpoche, the elder son of His Holiness Sakya Trizin, visited Bristol's Sakya Centre (Sakya Thinley Rinchen Ling) this month at the invitation of Lama Jampa Thaye. His Eminence, Lama Lekshey (manager of Sakya Centre in India) and entourage arrived in Bristol on the afternoon of Thursday, 4 August and were greeted at Sakya Thinley Rinchen Ling by members of the local sangha. 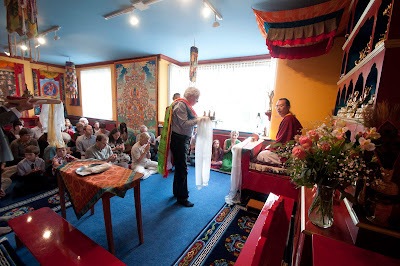 In the evening Lama Jampa Thaye made the traditional offering of the Mandal Tensum to His Eminence in the shrine room at the Centre. This was followed by a reception with food, which was attended by members of the Sakya Thinley Rinchen Ling sangha who had spent several weeks preparing the Centre for the visit. 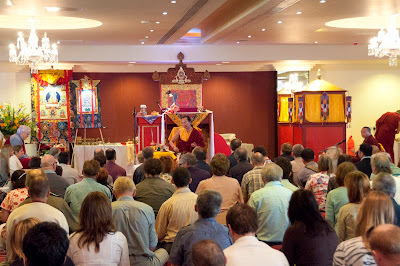 On Friday, 5 August His Eminence visited Bath where he was greeted by members of the Bath Sakya group. 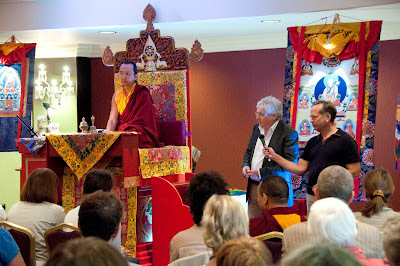 In the evening he gave a public teaching in Bristol, entitled ‘The Middle Way in Buddhism’. The event - held at the newly refurbished Bristol Hotel - was attended by 180 people, including sangha and members of the public. On Saturday 6 and Sunday 7 August, His Eminence bestowed the major initiation of Vajrakilaya. 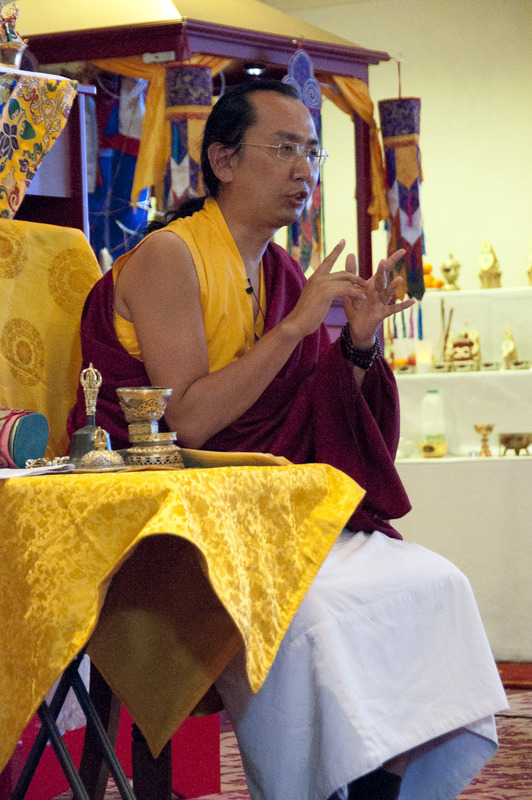 The lineage for this particular initiation has been held within the Khon family since the time of Guru Padmasambhava. The empowerment was also held at the Bristol Hotel and was attended by 170 people, including attendees from Europe and the Americas. Towards the end of the initiation His Eminence asked Lama Jampa Thaye to teach Sakya Pandita’s famed commentary on the vows and pledges which attendees should guard having received such a high level initiation. 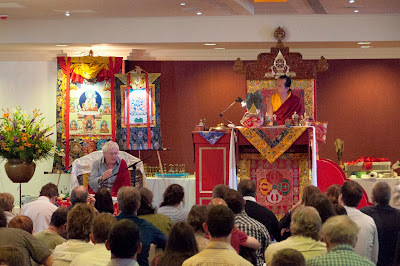 Lama Jampa taught this text to the attendees, following which His Eminence concluded the initiation and led the assembly in dedicating the merit from the weekend to all sentient beings. 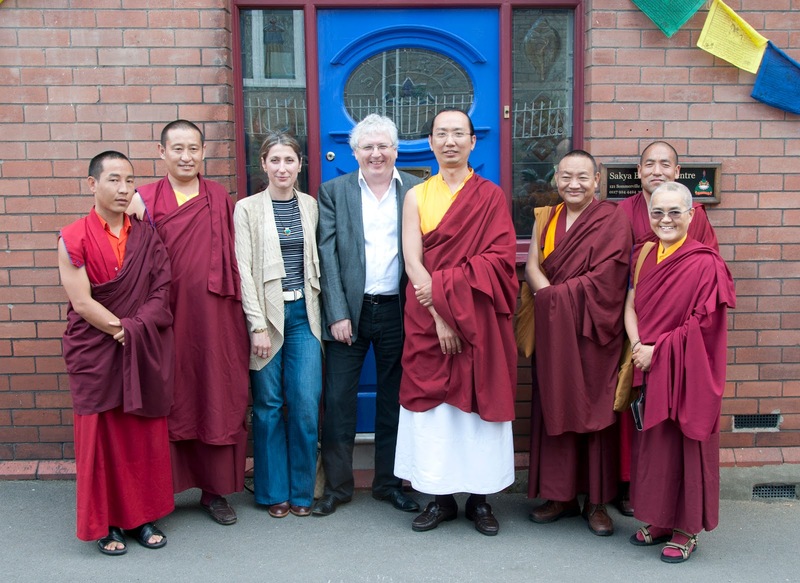 The visit marked the first time that His Eminence bestowed teachings in Bristol, having visited the Bristol Sakya Centre on two occasions previously when accompanying His Holiness Sakya Trizin on teaching tours of the UK. His Eminence is currently visiting Sakya Thubten Ling, Bournemouth, following which he will travel to our Centre in London, Sakya Dechen Ling, where he will, among other things, bestow the initiation of Orange Manjushri.